The food is great. Service is impeccable. I love their couches. Hi blissful mommies! How was your Halloween? I hope it’s all good. 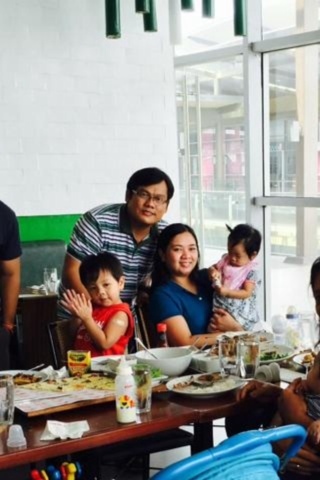 As for me and my family, we had lunch at Gerry’s Grill, Robinson’s Place Las Piñas to celebrate my nephew’s 1st birthday (from the mister’s other brother). After that, we visited and prayed for my brother-in-law, Dr. Charlemagne D. Aguinaldo who died last October 8 due to CKD (chronic kidney disease) and AKF (acute kidney failure). His ashes are kept at the Santuario de San Ezekiel Moreno Columbary. 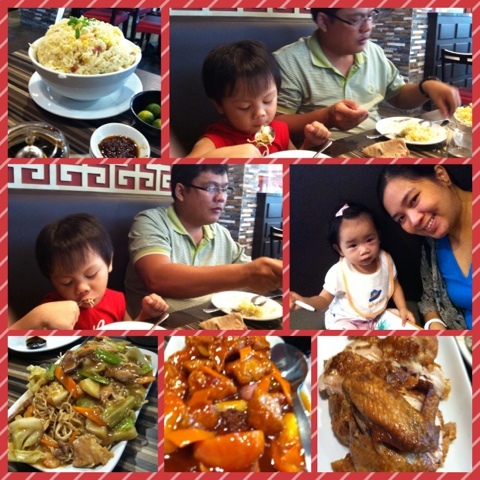 Moving on to our blissful mom agenda, I realized that we spent 4 hours at Gerry’s Grill last November 1. We were there first at 12PM, then my sister-in-law and her family arrived at 2PM. After that, Iboy’s (Dr. Charlie Aguinaldo) highschool best-friends arrived. Imagine, 4 hours! It was a proud mama moment really because none of my chikitings threw a tantrum. Thank God. Truth is, they are manageable whenever we are outside the house, most of the times, at least. Still, I’m so happy and proud. I do not really have a secret but the following might just help you and the mister enjoy a meal even with your children! 1. Tablets/Gadgets. This is the time when I find tablets for kids truly useful. In short, I let them use tablets or gadgets to keep them busy while we eat. I know that it’s not always beneficial ideal to let the gadgets be the baby-sitter but when you are dining in a restaurant with the kids, you will need all the help you can get to keep them in their seats for at least two hours. Tablets can give you those 2 hours. You will have the time to enjoy your food. After you finish your meal, you may then assist your kids in their eating. The key to gadget use is I think moderation, specific time and rule abidance. (That sounds another good post to share!) What I’m just trying to say is that we cannot ditch technology in our children’s life, not at this age! What we can only do is monitor and help them balance their time and activities. So, might as well use technology at our advantage, diba? You may ask what do my kids do/watch in their gadgets. Jonath loves puzzle games and any games that involves fishes while Claret loves watching nursery rhymes. Be warned though, they will keep changing their interests so be ready. 2. Draw or Write. I don’t know about other kids but this is worth a try. Both my children love to draw and write, thank goodness! That’s why I always have a notebook and Art Attack’s Washable Pens in the baby bag and bring it out whenever I need a moment of silence and peace. I only bring washable pens and I find Art Attack’s as the best so that I will not need to worry about staining tables, chairs and walls of the diner. If your kids are not into writing, maybe they are into reading or coloring. These tiny people have different interests so if you know your child, I’m pretty sure you can think of something that will keep his attention for a longer period of time. 3. Tire them a bit. I said a bit because if you exhaust them, they might get sleepy na and cranky pa. So be careful. I think a 20-30 minute walk would be fine. I walk them outside the restaurant (if there’s some safe place to walk on, like if it’s inside the mall) for a few minutes, usually while waiting for our orders to arrive. We ask how long is the serving time and from there we would know how much time do we have to tire them “a bit”. If the serving time is 1 hour or more, we usually don’t let them walk for the whole 1 hour. We carry them and keep them entertained sight-seeing. Once the food is ready, we go back and eat. 4. Encourage them to eat with you, whether it’s the food you order for them or the one you bring. Aside from washable pens and papers, I also always bring them some baon because more often than not, kids especially toddlers won’t eat what we adults eat and vise versa. You can order spaghetti, fries, pancakes but they won’t be able to finish them. Sometimes, they won’t like the taste pa, so sayang lang! 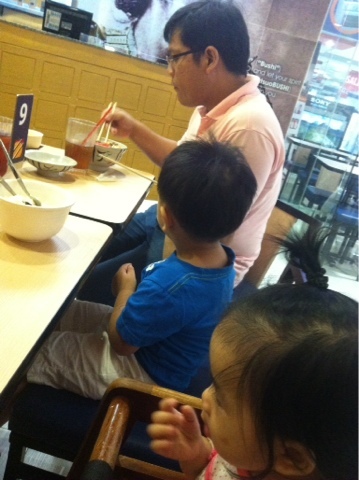 What I do is I try to make them eat what we order for them but I don’t get too pushy unlike when we are at home. But, I always bring their favorite biscuits and mamons. Solved! They can finally eat with us. I’m usually more lenient when we are outside. It works for all of us. I also bring them their own dessert, like marshmallows. My kids love it. That should keep them in their seats for an hour na. 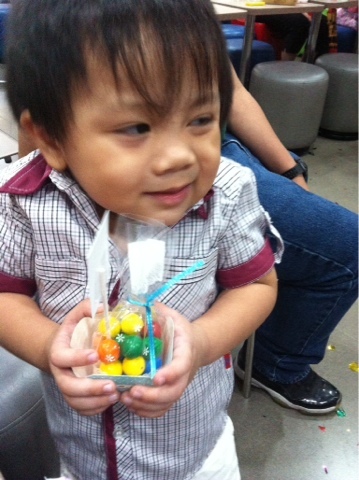 Jonath happy with party candies! My bonus tip is to choose as much as possible, kid-friendly restaurants with couches. It gives them room to move and in case they fall asleep, they can lie down pa. That’s it! You see, eating out with children is not as complicated as it seems. It could be tiring and you know, different (no exactly the same dining experience with the kids) but just enjoy and cherish the moment because it’s not gonna be forever! I hope you find the above tips helpful once your family dine out. If you try it, I’ll appreciate a feedback and if you have your own “tricks” which you would like to share, please do so by hitting the comment button. Let’s make parenting closer to bliss for everyone! At Uncle Cheffy (my favorite). We surely are family of blissful eaters!